Decision-making processes taking place in increasingly complex traditional and network organizations require the use of modern decision support systems. As a result of these solutions, decisions are made to support the development of the organization, its modernization, and thereby lead to increased competitiveness. The subject of the analysis of decision-making systems in organizations has been explored in a number of publications. 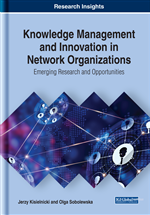 This chapter addresses selected problems concerning the design and functioning of the decision-making system in traditional and network organizations. Particular attention was paid to the analysis of the decision-making process and the tools used to support this process. The results of research on evaluation of available solutions, especially in the field of information technology, in decision-making processes in network organizations were also presented. The decision is the result of a choice in which the condition for decision-making is the existence of at least two possible solutions. The decision is closely related to the person or persons who make it, and who is/are capable of making it both in terms of their emotions and skills. Decisions can be analyzed narrowly (results) and broadly (actions). The narrow approach is understood in this case as the final result of the decision, i.e. the choice that is made by the decision-maker in a conscious and deliberate way. In action terms, a decision is the process of deciding, or how a particular decision is made. The decision-making process consists of steps such as defining the problem, setting goals, identifying resources and constraints, identifying possible solutions, selecting one solution, implementing it, and evaluating the outcome. Decision-User: Person for whom the decision may be relevant. A decision is always related to the concept of change. Such change may be the decision to transform the organization, e.g. from a traditional into a network one, or the development of a network organization. An important premise to be accounted for during the process is the issue of responsibility for the outcomes and consequences of decisions, which imply not only economic but also social and ethical effects (Walczak, 2012). The consequences of decisions can vary from internal (i.e. affecting the organization, its members, or financial performance) to those of the inside-out effect. In the latter case, there is an entire range of consequences that affect the environment. Impact on the environment, understood in a very broad way (i.e. not limited only to customers and competitors), is a problem that is being increasingly analyzed both in science as well as in the practical management of organizations. This topic is defined collectively as corporate social responsibility (CSR) and it is understood as a strategic opportunity and a set of commitments that the organization should analyze in its decision-making processes (Davis, 2005, 87). There are dozens of definitions of Corporate Social Responsibility. The definition that is officially accepted by United Nations is “a management concept whereby companies integrate social and environmental concern in their business” (UNIDO, 2017). The main goal of all CRS actions are: to control impact of business for society and to increase benefits provided by business to the community and to fulfill the main principle “do not harm” any more.